** Come and enjoy fine living in this amazing custom built estate located in the prestigious gated golf course community of Heritage estate. This magnificent property featuring breathtaking panoramic views of the canyon, mountains and valley. Masterfully designed home mixing tranquil environment with timeless architecture. This beautiful house is sure to appeal to aficionados of enjoyment with one levels of luxurious interior offering gorgeous 7 Bedrooms suite, 8 full bathrooms & half bath. 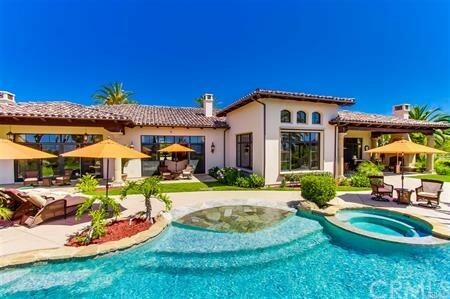 executive offi** Come and enjoy fine living in this amazing custom built estate located in the prestigious gated golf course community of Heritage estate. This magnificent property featuring breathtaking panoramic views of the canyon, mountains and valley. Masterfully designed home mixing tranquil environment with timeless architecture. This beautiful house is sure to appeal to aficionados of enjoyment with one levels of luxurious interior offering gorgeous 7 Bedrooms suite, 8 full bathrooms & half bath. executive office. home theater/ media room and gym w/ sauna and steam shower. Flowing floor plan w/ spacious family room open to an entertainers dream, covered veranda w/ fireplace, built in BBQ, dramatic pool & spa, tennis court. Lush landscaping and fruit trees/ flowers. This home has a well for landscaping needs and solar panels make it GREEN home! All you need to do is move-in and enjoy it.